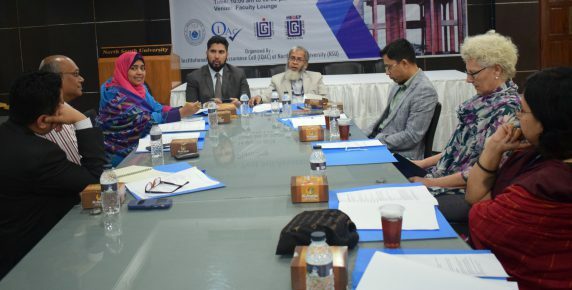 NSU IQAC called a special meeting to do brainstorming on the proposal for certification program in higher education teaching and establishment of a Teaching Learning Centre (TLC). The meeting was held on Wednesday, 14 March 2018 at 3:30 pm at the faculty lounge of NSU. The meeting was attended by: Dr. Nazmun Nahar, Director, IQAC, Dr. Md. Sahadet Hossain, Additional Director, IQAC, Dr. Ahmed Tazmeen, Quality Assurance Specialist, QAU, UGC, Dr. Abdur Rob Khan, Dean, School of Humanities and Social Sciences, Dr. M. Mahboob Rahman, Dean, School of Business and Economics, Dr. Mohammad Riaz Uddin, Associate Professor and Chair, Department of Accounting and Finance, Dr. Katherine Li, Assistant Professor & Director, External Affairs, Ms. Shahnaz Parveen, Senior Lecturer, Department of Public Health and Ms. Tania Rahman, Lecturer, Department of English and Modern Languages. In the meeting the participants discussed various aspects of the certification program and its effectiveness. They also discussed how to proceed with the proposal for TLC. It was decided that NSU IQAC will develop the proposal for TLC, get feedback from the participants, and then place the final proposal to the VC for his office to do the needful. The certification program will kick in as one program of the TLC and needs to wait until finalization of the Centre in papers.